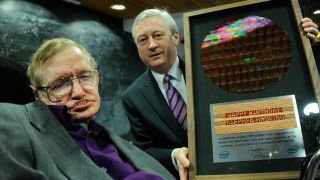 Intel has gone the extra nanometre in its celebration of Professor Stephen Hawking's 70th birthday, presenting the iconic scientist with a custom silicon wafer. The chip giant felt that good old cardboard and glitter wasn't nearly good enough for Hawking - and decided that it would inscribe the message 'Happy Birthday Stephen Hawking' hundreds of time on a one-off 300mm wafer using its 32nm manufacturing process. That meant using nano-scale copper lines for letters ten times narrower than a human hair. Hawking is, of course, recognised as one of the scientific luminaries of our time, winning the Einstein Award, penning A Brief History of Time and theorising that black holes emit radiation. Intel, describing Hawking as 'extraordinary', was obviously also keen to highlight that Hawking's Centre for Theoretical Cosmology uses a Cosmos Mk IX with Intel inside. The chip giant is also working with Hawking on improving his communications - allowing the genius to communicate his ideas faster despite the motor neurone disease that has left him disabled.